Boyfriend was a British magazine that was aimed at young girls and that embraced the British pop music scene. "their sound, although novel, isn't exactly a revolution. But there's something about it, a strange compelling something. ""They are almost frightening-looking young men," she continues, "even more modern than modern. The funny thing is that when they smile - not often - they look perfectly wholesome and nice. But the rest of the time they look wicked and dreadful and distinctly evil, in an 18th-century sort of way. You almost expect them to leap out of pictures and chant magic spells." 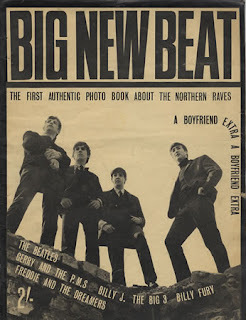 Later, during the summer of 63, Boyfriend would issue a photo book called "Big New Beat" and that contained pictures of the Beatles among the rubble of Easton Road.